Home > Research Express News > Have you picked up your tickets for this year’s Leadership Lecture Series? Have you picked up your tickets for this year’s Leadership Lecture Series? 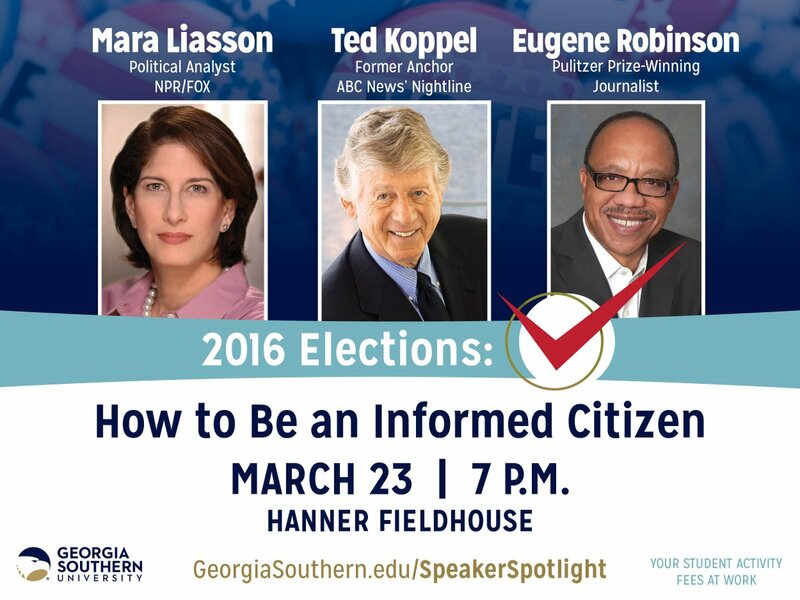 Georgia Southern University will welcome award-winning journalists Ted Koppel, Mara Liasson and Eugene Robinson to discuss “2016 Elections: Voting as an Informed Citizen,” on Wednesday, March 23, at 7 p.m. at Hanner Fieldhouse. The panel of speakers is part of the University’s Leadership Lecture Series, developed to expose students to insights from world-class leaders. Tickets are required, and are free and available on a first-come, first-served basis. Tickets will not be available at the door the evening of the event. The following dates have been designated for students, faculty, staff and the community to obtain their tickets. Tickets will be distributed 8 a.m. to 5 p.m. daily at the Office of Leadership and Community Engagement, Russell Union room 1056. Students need to present their Eagle ID at the time of ticket pick-up and will be limited to one ticket per person. Faculty and staff also need to present their Eagle ID at the time of ticket pick-up and will be limited to two tickets per person. Tickets will be distributed 11 a.m. to 6 p.m. daily at the Hanner Fieldhouse box office. Tickets will also be available to the local Savannah Community at the Coastal Georgia Center, located at 305 Fahm Street next to the Savannah Visitor Center, during regular business hours. Please plan to arrive early and note that doors will close at 6:45 p.m. No one will be admitted to the event after that time. No photographs or recording of the event will be allowed. For more information on ticket distribution, please visit GeorgiaSouthern.edu/SpeakerSpotlight.